Pull out lid foam doubles as test beacon floation device. Six different direction finding modes for varying conditions, accessed by holding down both the Pwr and Down buttons. Direction finding modes allow the Hammerhead to work with pulsed beacons (minimum 0.5 second pulse). Carrier detect circuitry triggers siren port when signal from a beacon is detected. Circuity prevents false alarms to non modulated signals so Hammerhead can be used for monitoring of activated beacons. A siren will alert a user that a transmitting beacon has been detected. Siren output can be connected to drive relays (lights, other sirens). 12V external power allows continuous monitoring without using internal batteries. Not to be used while direction finding.. The Hammerhead has two different types of signal processing modes, peak and average and three different periods which the signal are analyzed for a total of six modes. 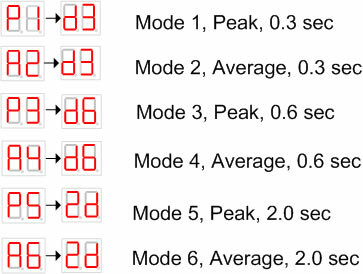 Peak mode can be used on pulsed beacons or when the signal strength is varying significantly. Average mode is when the signal strength is fairly constant but needs averaging to steady the display. The time which the signal is analyzed can also be changed from 0.3 seconds, 0.6 seconds and 2 seconds. The different modes are cycled through by holding down the Pwr and Down buttons simultaneously and then released. Don't know which mode to use, just cycle throught he different modes until the directional indicator is steady and/or the signal strength indicator is steady. Indication of the mode and the processing period is shown on the front display. The picture on the left shows the front display after the buttons has been pressed. See the manual for more information. 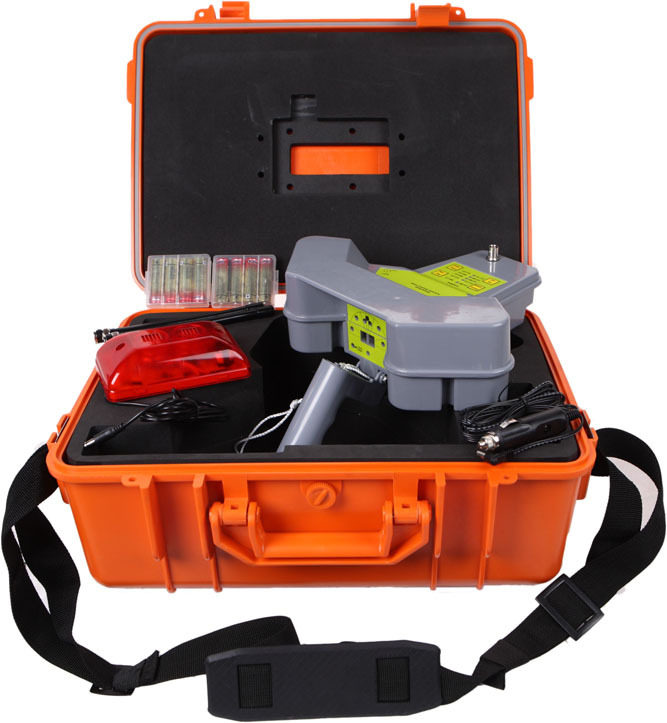 The lid foam can be used as a float for test beacons and has been precut to fit with the Tracker ELT and Tracker ETX test beacons made by Tracker Radio. It may be adapted to fit other beacons as well. Note: as of 2014, Tracker Radio may no longer be selling the test beacons. The foam is used with the Tracker ELT test beacon. Note that this is a pulsed beacon. PLBs transmits a constant signal, so it is not recommended for most testing and training purposes. For more information please refer to the User's manual. Four mounting nuts, bolts and washer which can be purchased at any hardware store is required to mount test beacon. Shown with Tracker ETX test beacon. This is a constant signal (aka CW) transmitter and transmit similarly to a standard PLB and is recommended for testing and training purposes. Two brass strips, four nuts, bolts and washers are required. Mounting hardware may be purchased at most hobby or harware stores. See Hammerhead User's Manual for more information. Note that RF Finding Systems is not affiliated with Tracker Radio.